A remarkable concept known as "entanglement" in quantum physics requires an incredibly bizarre link between subatomic particles. When one such particle is observed, quantum entanglement demands the rest of them to be affected instantaneously, even if they are universes apart. Einstein called this "spooky actions at a distance", and argued that such bizarre predictions of quantum theory show that it is an incomplete theory of nature. In 1964, however, John Bell proposed a theorem which seemed to prove that such spooky actions at a distance are inevitable for any physical theory, not just quantum theory. Since then many experiments have confirmed these long-distance correlations. 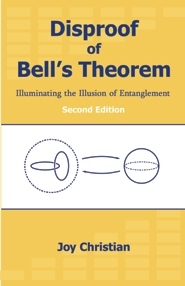 But now, in this groundbreaking collection of papers, the author exposes a fatal flaw in the logic and mathematics of Bell's theorem, thus undermining its main conclusion, and proves that---as suspected by Einstein all along---there are no spooky actions at a distance in nature. The observed long-distance correlations among subatomic particles are dictated by a garden-variety "common cause", encoded within the topological structure of our ordinary physical space itself.